I've been on a Instagram funk recently so it's been super neglected. However, I'm hoping to get back into the groove over the next few weeks. I've been lacking in the crafty aspect and decided it was time to make a new bookmark or bracelet whichever happens first. 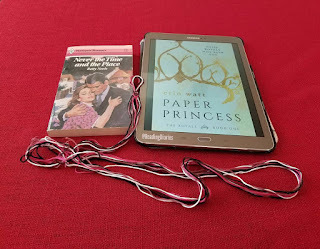 I just finished Paper Princess and loved it. I can't wait to dive into the next one. I also pulled one of my classic paperbacks off the shelf that I was craving. I just haven't gotten to it yet. Awesome picture! I need to read that book!